The DKW Monza was a sports car built on the chassis of the successful DKW 3=6 coupe. It was produced from 1956 to 1958 in limited numbers, and featured a fiberglass body fitted to the chassis and equipped with the same engine as the coupe. That engine was a 900cc two-stroke producing about 40hp. However, the Monza was much faster than the coupe due to far better aerodynamics, and a weight of only 1720lbs. 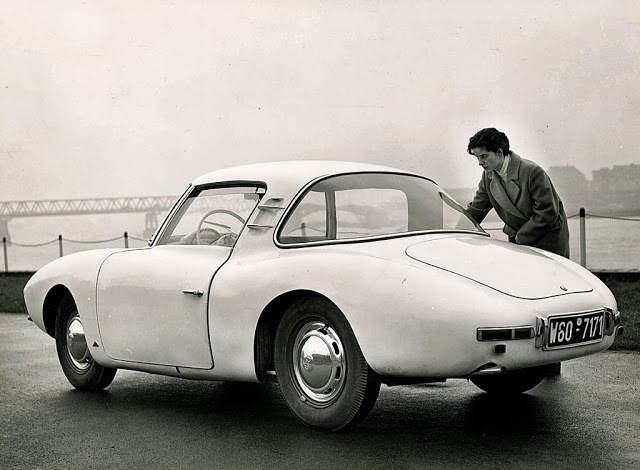 A prototype was first shown at the Frankfurt show in 1955. Designed by Gunther Ahrens and Albrecht Mantzel, the car has interesting styling cues that are similar to the Mercedes 300SL, the BMW Glas coupe, BMW 507, and the Alfa Veloce Sprint Speciale. It was a compact and stylish car. DKW used several different coach builders for the car, and so there were resulting variations and uncharacteristic gaps in the record keeping.. In late 1956, a quartet of drivers (Gunther Ahrens, Heinz Meier, Roberto Barbay, and Georg Thieler) set five international records with the car around the circuit for which it was named at Monza. The car proved popular on the heels of these records, particularly in the USA. Ultimately though, only somewhere between 230-250 cars were produced. The primary reason for this was that parent Auto Union already had a sporty successor in the works. The Auto Union 1000SP was launched in 1957 and the short reign of the Monza came to a close in 1958.